Seven years ago, I came home to a terrible surprise: My 10-year-old cat Cosmo lying dead in the hallway. Cosmo had just received a clean bill of health from the veterinarian and was completely normal only an hour before. Although I did not pursue a necropsy to confirm, my veterinarian suspected that Cosmo died from hypertrophic cardiomyopathy. In both people and cats, hypertrophic cardiomyopathy is often linked to genetic mutations, and nearly all the discovered mutations involve a gene that develops an abnormal protein in the heart muscle. Unlike lab rodents, cats show the same symptoms, disease progression, and response to treatment as affected people, making pets a better model to test novel drugs. 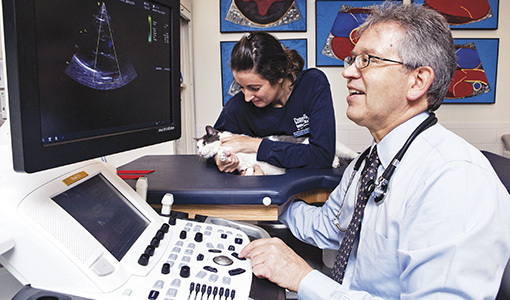 “Cats really serve as a great model for us to learn about hypertrophic cardiomyopathy,” said Martin Maron, a coauthor on the paper and director of the Hypertrophic Cardiomyopathy Center at Tufts Medical Center. “There aren’t all that many examples of human heart disease being present in almost exactly the same form in animals.” More clinical trials in pet cats being treated for the condition also would be a potential boon for feline medicine, which has no real public funding to study new veterinary therapies for the heart disorder. One mystery to unravel is why even affected siblings can have such different outcomes—for example, one brother enjoying a long life free of symptoms of hypertrophic cardiomyopathy, the other dying young from heart trouble. Lisa Freeman, J86, V91, N96, a veterinary nutritionist at Cummings School and the lead author of the Cardiology Research paper, said this may be because other modifier genes or environmental factors affect the disorder’s severity. Several studies by Cummings School veterinarians have demonstrated that, compared with healthy pets, cats with hypertrophic cardiomyopathy have bigger skeletons, larger heads, and higher concentrations of insulin-like hormones related to growth and glucose—and that these animals tend to grow bigger more quickly in early life. Freeman said that these data suggest that diet and growth patterns early in life, even in utero, may play a significant role in how the disease develops.